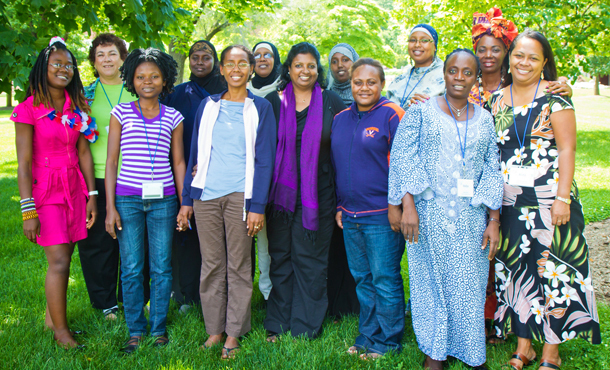 Gwendolyn Myers (left in pink dress), founder of Messengers of Peace in Liberia, and Vaiba Flomo (in pale blue dress, third from right), studied conflict transformation at EMU in 2012 with other pictured members of the Women's Peacebuilding Leadership Program. Their service organizations – and, through them, Liberians affected by Ebola – will be the beneficiaries of a fundraising effort initiated by EMU's international students featuring Nobel Laureate (and alumna) Leymah Gbowee on Feb. 7, 2015. Further info at end of this article. Ebola is frightening – terrifying even – but bowing to the fear that Ebola can produce invites additional unrest and cultural destruction in societies already reeling from recent civil wars. Instead, a lasting solution will emerge from tapping the resilience and resourcefulness of the people themselves. These are the messages being spread by alumni of the Center for Justice in Peacebuilding (CJP) of Eastern Mennonite University who are working in West African countries affected by Ebola. Liberian peacebuilding alums Nathaniel Walker (CJP MA ’10) and Gwendolyn Myers (CJP Grad. Cert. ’14) offered similar sentiments in commentaries published in The Guardian and the Liberian Daily Observer, respectively. Local efforts include developing the Pen-Pen Peace Network, an initiative of motorcycle taxi drivers. The Network has communicated about Ebola prevention through text messages, billboards, social media and loud speakers, distributed 3,000 fact sheets through communities, and built handwashing sanitation stations for citizens, wrote Walker and co-author Kai Kuang in an Oct. 15 commentary. In another grassroots initiative, Vaiba Flomo (CJP Grad. Cert. ’13) has rallied her close-knit Rock Hill community in Monrovia – where many of the 25,000 adults and children survive by hand-crushing rocks to sell for construction projects – to do health education. With her women’s team (called GSA Rock Hill Community Women), Flomo has distributed buckets, chlorine, and soap to various groups and centers where youths and adults typically gather, including clothing shops, prayer bands, video clubs, and drug stores. In an impoverished community largely ignored by governmental agencies, Flomo and her team have received funding from the Gbowee Peace Foundation Africa. In both Liberia and Sierra Leone, peace remains tenuous and distrust runs high (in many of these communities victims and perpetrators are living side-by-side), so fighting Ebola is intimately tied with communities’ ability to transcend past transgressions and develop open and honest communication. 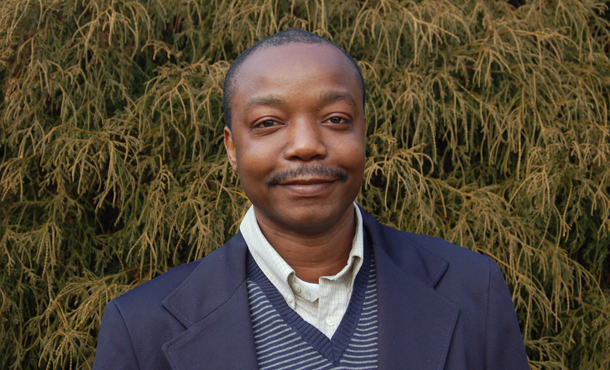 “Lack of trust within communities is the unseen but powerful inhibiter of Ebola prevention and treatment initiatives,” writes Hoffman, whose charitable foundation, Catalyst for Peace, is the main U.S. backer of Fambul Tok, a Sierra Leonean peacebuilding initiative. As an example Michaela Ashwood, who attended SPI ’14, heads a group called Peace Mothers under Fambul Tok. These mothers have been distributing soap and promoting handwashing in six mainly rural districts of Sierra Leone, seeking to reach about 250,000 households per district, often by going door to door. “We believe that the outbreak will end when actors at all levels – the national and district governments, community-based organizations and the health sector – work cooperatively to engage local communities,” said a “project report” released Sept. 2, 2014, by the Gbowee Peace Foundation Africa, founded by Nobel Peace Laureate Leymah Gbowee (MA ’07 in conflict transformation). This seems to be happening at last. The tide seems to be turning from Ebola in West Africa. On Jan. 15, BBC News reported that weekly UN figures show a decline in new Ebola cases in Liberia, Sierra Leone and Guinea. Even though the “death toll from the world’s worst Ebola outbreak has reached 8,429 with 21,296 cases so far,” schools in Guinea opened Jan. 19 after a five-month closure and the national daily infection rate in Sierra Leone is two-thirds lower now than it was in November. Liberia had its lowest weekly total since June and all three countries “have sufficient capacity to bury all the people known to have died from Ebola,” said the BBC. In Sierra Leone, New York Times reporter Jeffrey Gettleman has found that the locals are proving amazingly resilient. Leymah Gbowee will be the featured speaker at a Feb. 7 fundraising dinner to support families who have lost loved ones or been displaced due to Ebola. The money raised will be distributed by the Gbowee Peace Foundation Africa to two Liberian service organizations founded by alumnae of EMU’s Women’s Peacebuilding Leadership Program: GSA Rock Hill Community Women in Monrovia, founded by Vaiba Flomo, and Messengers of Peace, a youth outreach group founded by Gwendolyn Myers. To attend the dinner or for more information, click here.